Parliament vote one short of unanimous. All Crimean citizens are now citizens of Russia. The State Duma adopted, in the first reading, a federal constitutional law on Crimea’s entrance into the Russian Federation and the formation of new entities in the country – the Republic of Crimea and Sevastopol, city of federal significance. In total, 445 deputies supported the document, made by the president, and one deputy was against. Parliamentarians also ratified the accession treaty of Crimea into the Russian Federation. The treaty received 443 votes in support with one vote against. 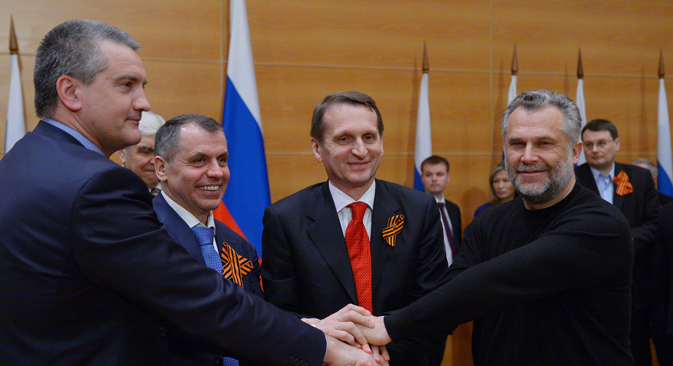 The document was signed on March 18 in the Kremlin by Russian President Vladimir Putin, Chairman of the State Council of Crimea Vladimir Konstantinov, Prime Minister of the republic Sergey Aksenov and Mayor of Sevastopol Alexey Chaliy. The results of the referendum held on March 16, as well as the declaration of independence of the Autonomous Republic of Crimea and Sevastopol; the Russian-Crimean agreement on acceptance into the Russian Federation; the formation of new constituent entities are basic documents for Crimea’s entrance into the Russian Federation. The republic officially became part of the Russian Federation on March 18, the date of signing of the agreement. Ukrainian citizens and stateless persons who are permanently living in the territories in the Republic of Crimea and Sevastopol are recognized as citizens of the Russian Federation. Crimean citizens must declare if they wish to retain their Ukrainian passports within one month’s time. The Russian Federation guarantees all peoples living on the territory of the Republic of Crimea and Sevastopol the right to preserve their native languages and to create conditions for their study and development. State languages of the Republic of Crimea are Russian, Ukrainian and Crimean Tatar. The borders of the Republic of Crimea and Sevastopol, city of federal importance, are defined by the boundaries of their territories at the moment of their entrance into the Russian Federation. The Republic of Crimea frontiers on land, neighboring with the territory of Ukraine, are considered the State Borders of the Russian Federation. Maritime delimitation of the Black and Azov Seas is based on international treaties of the Russian Federation, as well as the norms and principles of international law. The election of state authorities of Crimea and Sevastopol will be held the second Sunday of September 2015. Prior to their election, the authority is exercised by Parliament – the State Council and the Council of Ministers of the Republic, and by the City Legislative Assembly in Sevastopol. Military authorities and military units of Crimea will conduct their activities in accordance with the legislation of the Russian Federation, before these bodies’ entrance into the units of the Armed Forces of the Russian Federation. It is assumed that by 2015, the taxes in Crimea will be credited to the national budget. Russia will provide financial support to Crimea and Sevastopol in accordance with the law on the federal budget for 2014 as well as the 2015 and 2016 planning periods. The law provides a transition period until January 1, 2015 to solve various issues related to the integration of new regions into all spheres of life of the Russian Federation. During this time, the regional bodies of federal executive bodies will be established. Based on the materials of Interfax and ITAR-TASS.